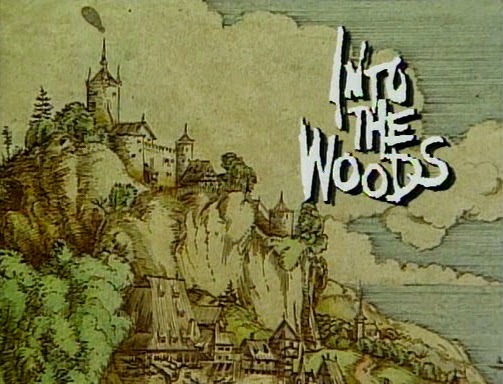 Into the Woods and after "happily ever after"
My friend Claire gave me a copy of the televised Broadway production of Into the Woods from 1991, and from the first minute of watching it, I was hooked. The story starts innocently enough, with your usual "Once upon a time" fairy tale opening, then the characters are introduced and their plights explained. Cinderella wants to go to the ball, Jack (of Jack and the Beanstalk) has to sell their cow, Little Red Riding Hood wishes to bring bread to his sick granny, and a childless baker and his wife yearn for a baby. Their paths, along with that of two princes' and another Brothers Grimm fairy tale character Rapunzel's, get intertwined by the workings of a witch who requires that the baker and his wife gather ingredients for a potion in order to lift the spell of barrenness she had apparently placed on them a long time ago. Into the Woods' first act shows us how the characters obtain their wishes, and the second act shows us what happens after "happily ever after." Stephen Sondheim and James Lapine's masterful way of telling a dark story in a witty and enjoyable manner, combined with Chip Zien, Joanna Gleason, Bernadette Peters and the rest of the cast's singing and acting, made me stay through all two hours and thirty one minutes of the video. I even applauded afterward like I was actually in a theater. Rob Marshall's controversial big screen adaptation of Into the Woods is enjoyable too, with an all-star cast consisting of Meryl Streep, Emily Blunt, James Corden, Anna Kendrick, Chris Pine and Johnny Depp—all seasoned actors with experience doing movie musicals (with the exception of Emily Blunt and Chris Pine, whose first time it is with Into the Woods but may very well not be the last time). Meryl Streep is stellar (are we still surprised? ), Emily Blunt and Anna Kendrick are wonderful, and though I haven't seen James Corden anywhere before, he plays the role of the childless baker particularly well. Daniel Huttlestone and Lilla Crawford, actual children playing Jack and Little Red Riding Hood, are quite impressive. Chris Pine is charming and funny, and Johnny Depp is appropriately creepy in that very short scene of his where he sings, "Hello, Little Girl." 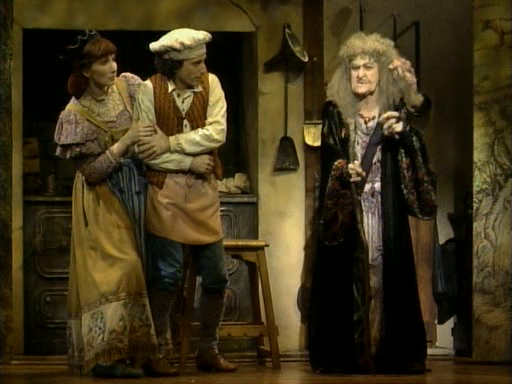 Not as creepy, however, as the anatomically correct wolf of the theater version, played by Robert Westenberg in the televised 1991 production. Which brings me to the much-discussed differences between the stage and film versions (spoiler alert!). 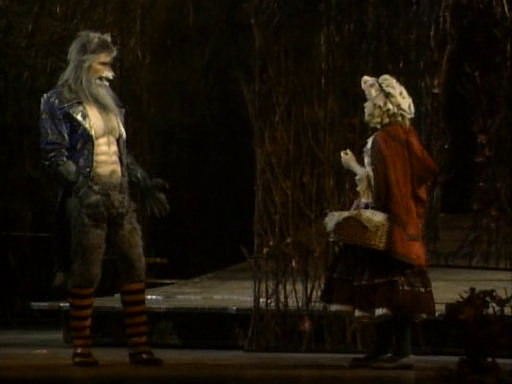 Robert Westenberg as the Wolf (in an NSFW outfit) and Danielle Ferland as Little Red Riding Hood in the 1991 Broadway production. 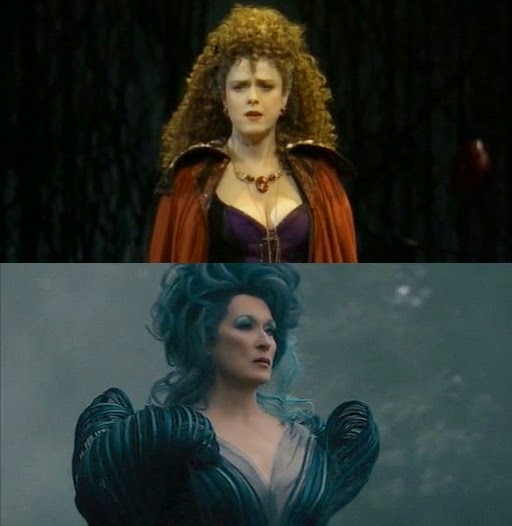 Aside from the special effects and the powerhouse cast, the film version of Into the Woods had, well, a "Disney-fied" story. The scene between Little Red Riding Hood and the wolf ("Hello, Little Girl"), and Little Red's "I Know Things Now" bit with the baker were desexualized a little. Downplayed too were the affair between Cinderella's prince and the baker's wife as well as the death of Jack's mother. And Rapunzel lives! Rapunzel doesn't go insane and get trampled by the giantess but runs off with her prince against her mother's plea, making the witch's song "Witch's Lament" lose much of its intended impact. When the witch sings, "No matter what you say, children't won't listen," the movie makes you think, "You gorgeous but evil witch, you deserve to be left behind by your so-called daughter!" But in the play, you're left thinking, "It's true. No matter how hard you try to guide your kids, there's always a chance they won't listen." Which makes the witch's later song "Last Midnight" all the more powerful. And this stings, because well, she was right (to a point). Her accusatory tone about their ambivalence works because she's the only person actively parenting (for better or worse). Up until then, the Baker couldn't even hold his own child. Keeping Rapunzel alive is committing the very crime of being 'just nice,' and this play is smarter than that. What's worse, in the end the cast agrees with the Witch in 'No One Is Alone,' singing, 'Witches can be right.' But in the movie version, she's not really right about anything." All these aside, there were two major changes I actually liked in the film version. One was that Cinderella's "On the Steps of the Palace" was sung while she and the prince were suspended in time and she was stuck on the steps of the palace. Another was that they gave the death of the baker's wife a bit more of the spotlight, because in the televised Broadway production it all seemed very abrupt. I also appreciated Sondheim changing the description of Jack's mother in the play from "Well, she was not quite beautiful" to "Well, she was at her wit's end" in the movie. Because it just makes more sense. Comparing the stage and movie versions, you're really going to see a lot of differences, but I have to say the movie turned out to be a good Sondheim/Lapine and Disney compromise, managing to retain the magic and improve the sound, while keeping the body count to a minimum and still making the story appealing to children. If we're really going to be honest though, Into the Woods is not a tale for kids. The play is rife with sexual undertones and parenting advice and it destroys the illusion of happy endings. It says, the cycle begins with a wish, and whether you get what you wish for or not, you'll likely be wishing for something more or something else again later, hence that one final "I wish" uttered by Cinderella at the end of both the play and the movie. So be careful what you wish for in the first place. 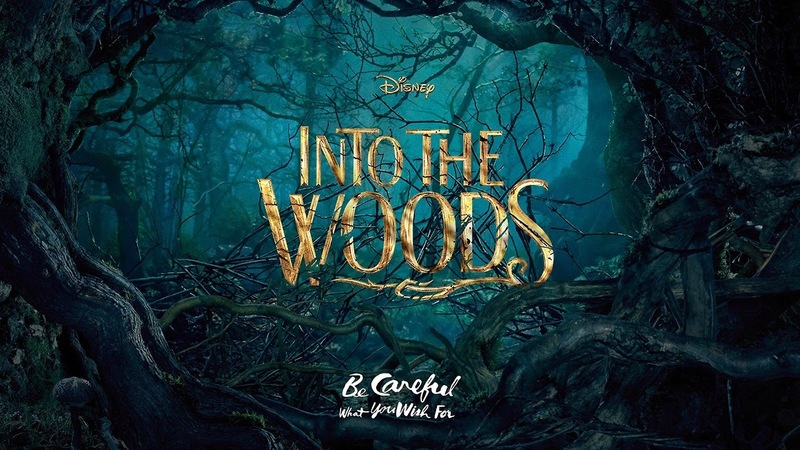 My tip to the uninitiated: Don't dismiss Rob Marshall's Into the Woods as a failed Disney adaptation. Watch the play first. 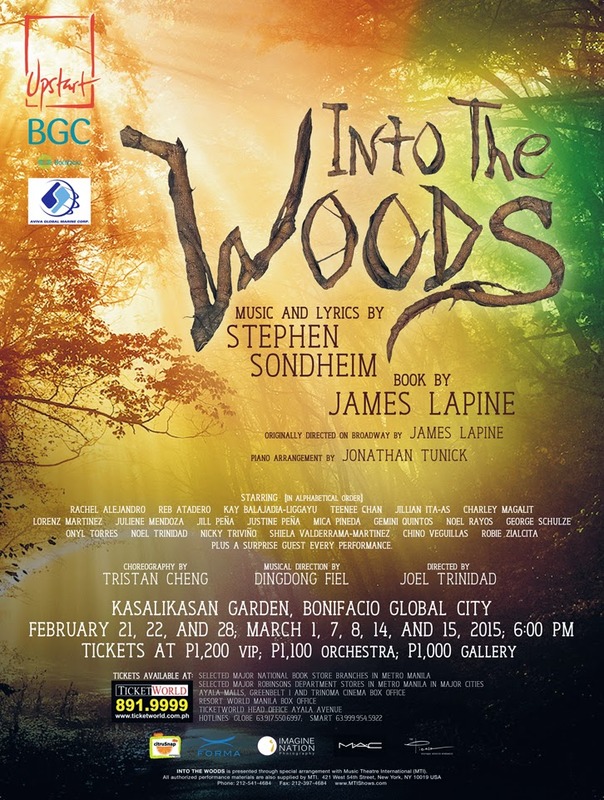 Stream it or download it from the Internet...or watch the upcoming Upstart production of the musical at the Kasalikasan Garden, BGC. I know I will.